The three Dorguys command this special breed of Chomp. In off-hours they like to practice their comedy act. 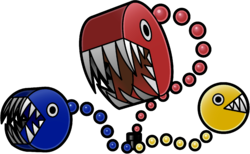 The Underchomp is a red, yellow, and blue three-headed Chain Chomp that acts as a guard dog of The Underwhere in Super Paper Mario. It is located in Underwhere Road. Beating the Underchomp is Dorguy the Third's test. Despite the fact that Dorguy the Third is the one that summons it, the Underchomp's Catch Card states that all three Dorguys have ownership of the beast. The Underchomp is based upon the legendary hellhound Cerberus, a giant, three-headed dog who guarded the gates of Hades in Greek mythology. In one story, he was put to sleep by the music of Orpheus, which inspired Piccolo's music putting the Underchomp to sleep. Mario, Luigi and Bowser face this beast in a far different way from other enemies in the game; they fight the creature in a turn-based battle, though it is farther from the style of other Paper Mario games, and closer to that of the EarthBound and Pokémon series. Its battle music is an 8-bit remix of the normal mini-boss theme. The player cannot use Tippi at any point during the battle with the Underchomp, and it does not appear in the field before or after the encounter, making it the only enemy in the game (and one of the few in the Paper Mario series) that cannot be Tattled. However, a Tattle exists in the game data. Each head has a special ability. The Red Underchomp breathes crimson fire, the Blue Underchomp breathes blue fire, and the Yellow Underchomp has stinky breath. Each Underchomp can also charge up for one turn to use a stronger attack later. Part of the Underchomp's battle system. Instead of battling the Underchomp in the style of the game's previous bosses, the Underchomp battle is a homage to text-based, turn-based RPG battles from the NES era, specifically the first four Dragon Quest/Dragon Warrior titles and the Family Computer game MOTHER which feature battle systems that look and function similarly to the Underchomp battle. In the following transcript of all the battle quotes, "[the] Underchomp" is used in place of "Red Underchomp", "Yellow Underchomp" or "Blue Underchomp" (the name used in the game depends on which head is involved in that particular attack). Similarly, "[The player]" is used in place of "Mario", "Luigi" or "Bowser" (the name used in the game depends on which character the player is using at the time). In cases where an entire line is specific to a character, * indicates that it only occurs when playing as Mario, ** is for Luigi, and *** is for Bowser. A "/" indicates that the outcome of the text shown can differ, and is generally used for attacks that can be avoided. Finally, different amounts of damage can be dealt by a single attack, so "[...]" is used in place of the number value that would appear in-game. Attack: "[The player] attacks! You deal [...] damage to [the] Underchomp! / But your attack is dodged!" Flip*: "Mario flips! ...But nothing happens." Flame***: "Bowser breathes fire! ...But the flames have no effect on [the] Underchomp!" Super jump**: "Luigi glares at [the] Underchomp and launches a super jump! You stomp [the] Underchomp for [...] damage!" Thoreau: "[The player] throws Thoreau at the Underchomp! Urg... [The] Underchomp is too heavy to lift!" Boomer: "Take that, enemy! [The player] throws Boomer! Boomer explodes! [The] Underchomp takes [...] damage! / Miss! The attack is a failure!" Slim: "[The player] uses Slim! [The player] turns sideways and is hard to see!" Thudley: "[The player] uses Thudley! A heavy-duty attack! The attack is a success! [The] Underchomp takes [...] damage!" Carrie: "[The player] hops onto Carrie! You feel a little taller! ...But that is the only effect, unfortunately." Fleep: "[The player] uses Fleep on [the] Underchomp! [The] Underchomp looks dizzy!" Cudge: "[The player] uses Cudge to attack [the] Underchomp! Direct hit! [The] Underchomp takes [...] damage!" Dottie: "[The player] uses Dottie! [The player] gets tiny! Where did he go?!" Dashell: "[The player] uses Dashell! [The player] dashes quickly! ...But nothing else happens." Mario** *** "Tippi says, 'Go, Mario!' [The player] switches places with Mario! Bowser* ** "Bowser says, 'Stomping time!' [The player] switches places with Bowser!" Luigi* *** "Luigi says, 'I'm on the job!' [The player] switches places with Luigi!" Escape: "[The player] runs away! ...But he got noticed! / ...A successful escape!" Mario*: "Tippi says, 'Mario! Noooo!' Mario falls in battle..."
Bowser***: "Bowser says, 'Not again!' Bowser falls in battle..."
Luigi**: "Luigi says, 'Bro! Forgive me...' Luigi falls in battle..."
"[The] Underchomp attacks! [The player] takes [...] damage! / [The player] dodges like a pro!" "Red Underchomp breathes crimson fire! Youch! [The player] takes [...] damage!" "Blue Underchomp breathes blue fire! Now that's hot! [The player] takes [...] damage! / [The player] dodges with style!" "Yellow Underchomp expels stinky breath! Oh no! It's putrid! [The player] takes [...] damage! / [The player] dodges the stink!" Slim/Dottie: "[The] Underchomp is looking for [the player]..."
Asleep: "[The] Underchomp is taking a nice nap..." / "[The] Underchomp wakes up!" "You defeated the Underchomp! [The player] receives 6000 points!" "You gained a level! Your HP increased by 5 / Your attack power increased by 1!" This page was last edited on April 9, 2019, at 17:41.